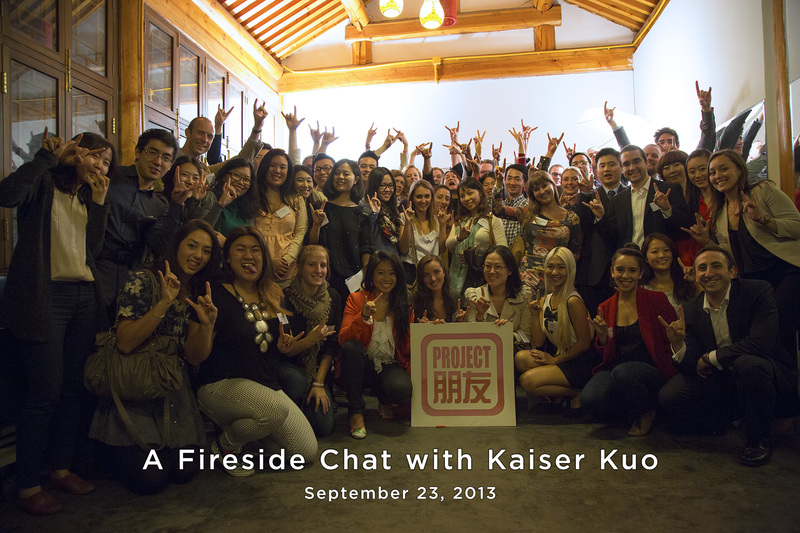 Kaiser Kuo drops by the Golden Bridges Courtyard to talk with us about his China journey. It was standing room only when the illustrious Kaiser Kuo dropped by the Project Pengyou Courtyard last Tuesday for a chat with our own George Ding and Alyssa Farrelly. 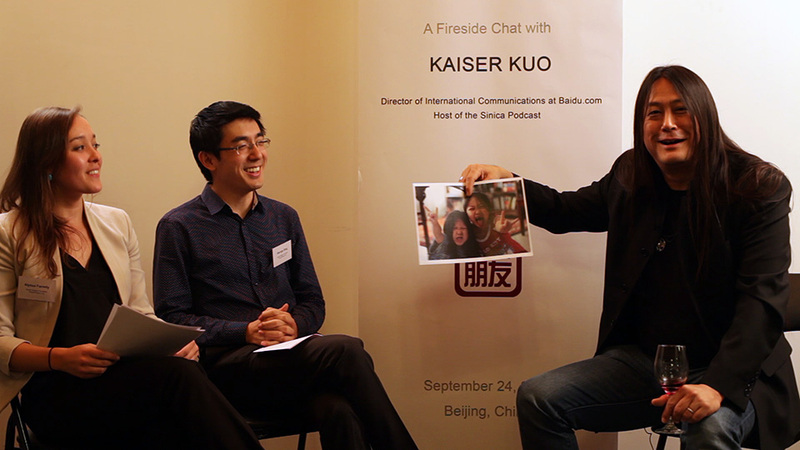 Kaiser is the Director of International Communications at Baidu, co-host of the Sinica podcast and guitarist for the Chinese rock band Spring and Autumn. He has also been a journalist, translator, back-page columnist for the Beijinger and guitarist and co-founder of Tang Dynasty, one of China’s earliest and most successful rock bands. How do you compress two decades of living, working and rocking in China into an hour? It was tough but Kaiser touched upon the things he cares about the most: music, family, work and improving U.S.-China relations. He talked about his unique position as an Asian-American and how it’s led him to become an important bridge between China and the West. Kaiser talking about his kids. He also stressed the importance of writing and keeping a record of your experiences in China. Even after the extended Q&A, the audience still had questions so Kaiser was gracious enough to stick around and talk with our audience of students and professionals. We are so grateful to Kaiser for sharing his time and accumulated wisdom. Check out our photo gallery for more photos and stay tuned for videos from the chat! Kaiser Kuo is the Director of International Communications at Baidu.com. He also hosts the Sinica Podcast, a weekly discussion of current affairs in China featuring prominent journalists, academics, and subject-area experts. Born in upstate New York to Chinese parents, Kaiser took his first trip to China in 1981, lived in China in the late 1980s after graduating college, and—having dropped out of a Ph.D. program in the US—came back to China in 1996. He has lived here ever since. Kaiser was guitarist and co-founder of China’s first and most successful heavy metal band, Tang Dynasty, which was founded in 1989. He rejoined the band from 1996 to 1999, at which point he joined a fledgling Internet startup called ChinaNow.com as editor-in-chief. Kaiser remains active in the music scene as guitarist of Chunqiu (Spring & Autumn), which recently played at the Wacken Open Air festival in Germany—the world’s largest metal music festival. His mission in life is to help build bridges of understanding between China and the Anglophone West, and he hopes he’s passed on that goal to his two children, Guenevere (9) and Johnny (7).